Brad Pierce began serving as Director of the Space Science and Engineering Center (SSEC) at the University of Wisconsin-Madison on Oct. 1, 2018. 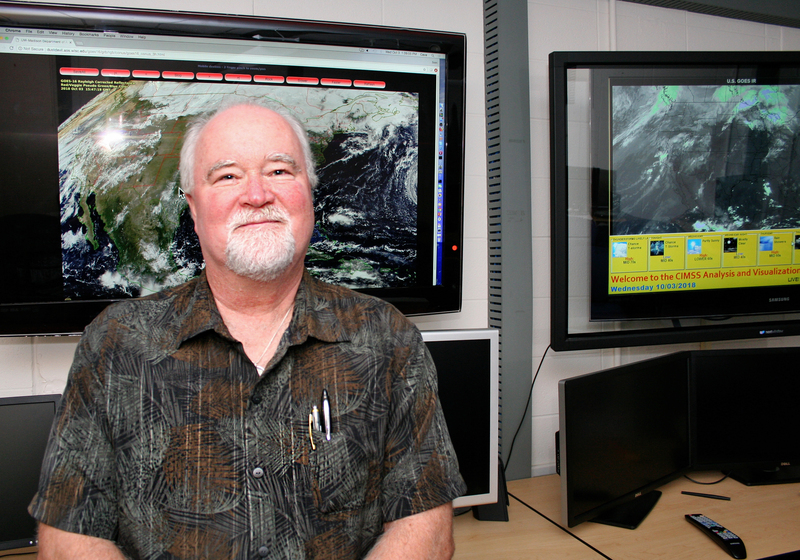 His background includes over 25 years as a scientist with the National Oceanic and Atmospheric Administration (NOAA) and NASA. We talked with him about his vision for SSEC, what he brings to the role and his ideas about how to meet current and future challenges and opportunities. SSEC: What excites you about the role of director and how have you been preparing for it? What challenges do see for yourself? BP: The most exciting aspect of this position is leading the Center at a time when we can play a key role in implementing the recommendations of the 2017 Decadal Survey for Earth Science and Applications from Space, very much in the same way we played a key role in the previous decadal survey. This new survey is aimed at making sure there is an applications component to all of the missions right from the beginning and I think SSEC is in a strong position to bridge the gap between NASA and NOAA – that is, making sure that the NASA research capabilities developed as a result of this survey have real applications on the NOAA side. We have always had a very strong research-to-operations capability. In terms of preparing for the role of director, I have been casually consulting with Steve Ackerman who served for two years as the interim director. Conversations with Steve and the leadership team at SSEC have helped me form a clearer picture of where we stand in terms of our transition to a new budget model within the university and any remaining issues associated with that transition. I see this – resolving any remaining issues and reaching a balanced budget – as one of the biggest near-term challenges in my role as director. SSEC: How would you characterize your leadership style? BP: I think of myself as an open leader and one who seeks guidance from the rest of the staff. In particular, I see myself as someone who supports and facilitates the science of the center, fostering an open exchange of ideas and options. I think this is important to the health of SSEC. In fact, building interdisciplinary teams to tackle scientific problems is one of my strengths. SSEC: SSEC is in the midst of organizational change. Leading SSEC might require additional change. Talk about your plan to address possible changes ahead, in terms of how you might manage competing priorities, if or how you would like to engage Center staff as a whole in this process, and how you plan to communicate along the way. BP: I think being inclusive, especially during times of change, is critical because change can result in lots of uncertainty. Making sure that all staff – scientists and support staff – feel included in the process is going to be a very high priority for me. The path that Steve Ackerman and the SSEC leaders charted during the last two years is the right one for SSEC. In fact, I do not plan to make any substantial changes in the next year. That said, the new budget model is going to require a much more conservative approach to spending, and that includes our reserve funds. How to navigate and complete that transition is my first priority. To address the gaps we have with the current budget model, I plan to announce an internal proposal competition that will provide seed money for innovative research, demonstrations, or capabilities. The framework for this competition would be very similar to the UW2020 competition that funds research projects requiring development prior to applying for external funding. My hope is that we can fund and develop some innovative ideas internally, putting them in a position to compete for other funds. We will need careful definition of scientific pursuits and budgets so that we can effectively manage the reserve fund. The goal is to reduce, and eventually eliminate, our reliance on reserves through successful competition for other funds. SSEC: What is your vision (or what is your big picture) for a strategic direction for SSEC and how will you advance it? BP: My overall vision is that we develop an increased focus on numerical weather prediction and data assimilation. The atmospheric sciences – and the earth sciences in general – is moving towards integration of observations into modeling to improve decision making. SSEC has historically shown leadership in the observation side of this equation and I think we need to be building out capabilities for integration of those observations into prediction systems. In addition, I think this is particularly important as we try to tap into funding through the Weather Research and Forecasting Innovation Act of 2017 that stresses the necessity of better observations and better modeling systems to improve, and extend, forecasts. If we are strategic in our thinking, we can be quite competitive with opportunities that emerge from The Weather Act, as well as the Decadal Survey and its emphasis on applications. We can contribute both on the observation side and on the information side well into the next decade. We are already doing a fair amount in the area of numerical weather prediction and data assimilation, but it is not represented as an area of expertise in the Center’s current organizational chart. As the nation moves more toward a community-based approach to the Next Generation Global Prediction System, we need to be poised to demonstrate our already strong capabilities. 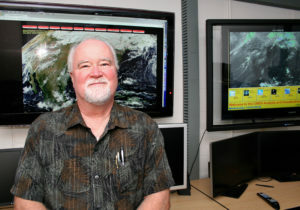 Because of our relationship with NOAA, we have a super computer installed at SSEC. It has the capacity to assimilate the satellite measurements within new models and we need to be tapping into this as an additional selling point for our capabilities. SSEC: How would you define a successful future for SSEC? How will you know you have succeeded? BP: In the short term, I think the first step toward success will be when we have completed the transition to the new budget model and are functioning without the reliance on the reserve fund. In the longer term, my goal is to expand SSEC’s role in the research-to-operations pipeline. We are a unique research center with a long history of core funding from NOAA and NASA. In addition, our peers in the community perceive SSEC as a research-to-operations center. I think we can maintain these strengths while we explore opportunities through the Decadal Survey and other observational arenas in order to improve our predictive capabilities. SSEC: What do you hope to accomplish in the first 12 months? BP: I would like to see a 50 percent reduction in reserve spending. We have made significant changes over the last two years but this will be the first full year of the new budget model: the first year when we will see a full complement of 101 and 150 funds from the university. We still have a gap that needs to be filled, that is, we are still spending more than we are taking in, but this is where the internal proposal competition comes into play. I would like to reduce dependence on reserves by increasing our proposal success for science as well as education and outreach. By the end of the year, I would like to have selected the first round of internal proposals, with input from the SSEC Advisory Council (SAC) on the proposal competition. They will be engaged in this process by helping to define focus areas and making the first selections of proposals to fund. I will want to have conversations with team members of the various research groups to hear about their strengths and goals. My background as a NOAA and NASA scientist has allowed me to cultivate and maintain relationships with both organizations, relationships that will be ever more important to me as director of SSEC and to SSEC as a whole. We have an opportunity to be a partner in this new triad: NASA, NOAA, and SSEC. So, yes. I will be knocking on people’s doors and engaging with principal investigators when I see opportunities that SSEC could lead or where I think SSEC could make a strong contribution. I also intend to have an open and ongoing dialogue about where the Center should be going as we consider NOAA, NASA and other announcements of opportunity. In terms of industry, SSEC has had strong ties with various vendors and the private sector has always had a place in large satellite programs. In addition, the Weather Act clearly outlines a place for industry in future initiatives. As we are pursuing options with the Decadal Survey, having those industry contacts will continue to be important to us as we further develop relationships with NASA. SSEC: Who are the leaders you most admire and why? BP: I have two: Barack Obama and Kathryn Sullivan, the former administrator of NOAA. I admire each of them for the same reasons: first, they are humble leaders and second, they lead based on science. Those are two leadership qualities that I appreciate, admire and try to emulate. SSEC: What do you see as the role of the SSEC Advisory Council (SAC)? How would you like to use their expertise and knowledge of the Center and its research? BP: I agree with the charter of the SAC to be advisory to the director on how to navigate the landscape of the SSEC budget. They will also be crucial in helping to provide transparency to the director, and from the director, as we make decisions, especially throughout this transition process. They will be an important part of the SSEC management team. Moving from the Transition Advisory Council to the SAC was a wise decision by the interim director Steve Ackerman. The Center staff had the opportunity to vote on a number of the seats on the council and the appointed members bring strong and varied backgrounds that will strengthen our ability to take advantage of opportunities across campus and beyond. I am very happy with their selection: Tracey Holloway (Nelson Institute for Environmental Studies), Tim Bertram (Chemistry Department), and Jim Hurley (Aquatic Sciences Center). The SAC will be very engaged in the selection of internal proposals and they will be available as questions arise about the leadership of the Center. I am honored to have the opportunity to lead SSEC in this next chapter of its history. I have a strong commitment to the continued success of SSEC as an international leader in the development and utilization of space-based Earth observations and look forward to working with everyone at SSEC as we continue to engage in research that benefits our state, the nation, and the world.